BetAnySports has earned a reputation as being one of the most diverse and player-friendly offshore sportsbooks in the sports betting industry for both international and US bettors. The following is a brief review of this online site. BetAnySports follows in the tradition of its parent company 5Dimes Sportbook as a one-stop shop for anyone who loves to wager on sports. It offers betting opportunities for one of the biggest varieties of sporting events in the world by posting a complete set of betting odds for just about anything you can think of. It also offers full-scale casino gambling, an expanded racebook for horses, and a poker room as well as access to lotteries and other various skill games. Both new accounts and loyal customers can benefit from a number of promotions and bonuses that BetAnySports currently offers. All new deposits are eligible to receive a 20% Free Play bonus upfront to a maximum of $200. For regular players, BetAnySports offers a generous Reduced Juice promotion that rewards you for how much you play. To further clarify all the aspects of its reward programs, BetAnySports has a separate Bonus/Rollover Rules page under the “Join Now” section in its website. In today’s world of complex and complicated websites that prove to be nothing more than fancy bells and whistles, BetAnySports has kept its online website simple and easy to navigate. It is set-up into separate sections for its Sportsbook, Racebook, Casino, Poker and Lotto offerings. The “Join Now” section is also designed to walk you through the simple process of opening an account and making an initial deposit to quickly get you in on all the action. While most online betting sites offer the basics when it comes to wagering on sports, BetAnySports takes things to a whole other level with betting options such as pleasers, reverses, if-bets, Asian handicaps, rolling if-bets, teasers and progressives, round robins and point buying. The Wager Types/Payoff page in the sportbook section of the website offers a detailed explanation for all of BetAnySports’ exotic wagers. BetAnySports also has Live Betting Extra which offers in-game betting options for sports such as soccer, football, baseball, hockey basketball and tennis. Under the umbrella of its parent company 5Dimes, BetAnySports’ customer service and support is second to none in the sports betting industry. You will always have direct access to a live agent to manage your account and many of your basic questions and concerns can be answered directly on the website. There are a number of methods to make deposits and withdraw funds. 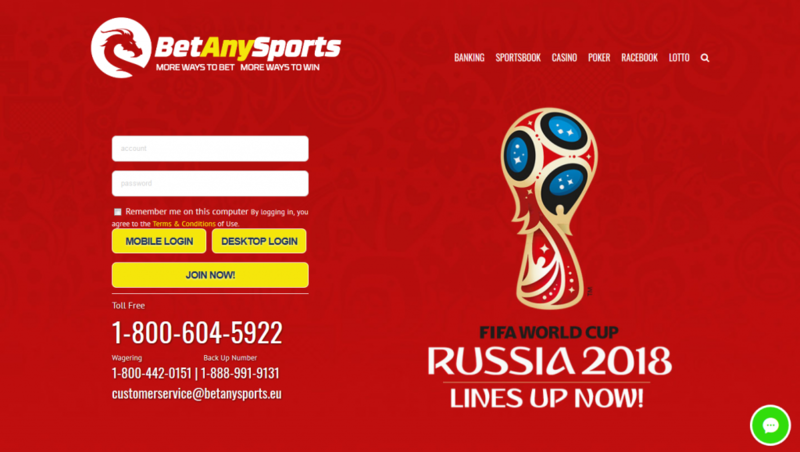 You can fund your BetAnySports’ account through the use of credit cards, checks, person-to-person transfers and wire transfers as well as through money transfer services such as Click2Pay, Gold-Pay, Moneybookers, Neteller, Instadebit and eWalletExpress. To withdrawal funds from your account you can use checks, person-to-person transfers and wire transfers as well as Gold-Pay, Moneybookers, Neteller, and Instadebit.